During the 1800s, the mortality rate from thyroid surgery was approximately 40%. Most deaths were caused by infection and hemorrhage. Sterile surgical arenas, general anesthesia, and improved surgical techniques have made death from thyroid surgery extremely rare today. By developing a thorough understanding of thyroid anatomy and of the ways to prevent each complication, the surgeon can minimize each patient's risk. Potential major complications of thyroid surgery include bleeding, injury to the recurrent laryngeal nerve (see the first image below), hypoparathyroidism, hypothyroidism, thyrotoxic storm, injury to the superior laryngeal nerve (see the second image below), and infection. Anatomy of the recurrent laryngeal nerve (RLN). Postoperative surgical site seromas may be followed clinically and allowed to resorb, if small and asymptomatic; large seromas may be aspirated under sterile conditions. Poor scar formation is frequently preventable with proper incision location and surgical technique. Hypoparathyroidism can result from direct trauma to the parathyroid glands, devascularization of the glands, or removal of the glands during surgery. Postoperative hypoparathyroidism, and the resulting hypocalcemia, may be permanent or transient. Hypocalcemia after thyroidectomy is initially asymptomatic in most cases. Currently, postoperative infection occurs in less than 1-2% of all thyroid surgery cases. Sterile surgical technique is the key to prevention; routine use of perioperative antibiotics has not proven to be beneficial. Hypothyroidism is an expected sequela of total thyroidectomy. Measurement of TSH levels is the most useful laboratory test for detecting or monitoring of hypothyroidism in these patients. Theodor Kocher, Theodor Billroth, and William S. Halsted are just a few of the names intimately associated with the development and refinement of thyroid surgery. Their contributions helped to make thyroid surgery less feared and better understood than it once was. Although the complication rate of thyroid surgery has certainly decreased, surgeons must nevertheless maintain a healthy respect for the possibility of complications. Patients must be appropriately and preoperatively counseled regarding potential complications. All must be well aware of the surgical risks they are undertaking. By developing a thorough understanding of the anatomy and of the ways to prevent each complication, the surgeon can minimize each patient's risk. The surgeon's experience is a significant contributor to various complications during thyroid surgery. At the same time, several reports have pointed out the safety of thyroid procedures performed at residency-training centers, where surgeries are performed under the supervision of an experienced surgeon. By understanding the presentation and treatment of each complication, the surgeon can handle complications expediently and avoid worsening consequences. In general, complications of thyroid surgery can be divided into minor, rare, or major. Several minor complications may result from thyroid surgery. Postoperative surgical site seromas may occur. These may be followed clinically and allowed to resorb if small and asymptomatic. Large seromas may be aspirated under sterile conditions. Repeated aspirations may be necessary. Poor scar formation is another frequently preventable complication. Ideally, the surgeon will design as small an incision as reasonable in a natural skin crease over the thyroid gland. The neck should be flexed to determine the location of the natural skin creases. This incision should provide adequate exposure and yet minimize the resultant scar. The surgeon should avoid excessive retraction which may damage the skin edges. If significant damage is present at the end of the surgery, the skin edges can be resected prior to closure. Rare complications, such as damage to the sympathetic trunk, are occasionally reported. Most of these are uncommon and can usually be avoided if the surgeon has good knowledge of the anatomy and sound operative technique. The following sections discuss major complications that may be encountered in the setting of thyroid surgery. An image depicting the regional anatomy can be seen below. Intraoperative bleeding stains the tissues and obscures important structures. Moreover, intraoperative bleeding increases the risk of other anatomic complications. Deliberate dissection and fastidious hemostasis are essential to prevent this complication. Postoperative bleeding can be a devastating complication of thyroid surgery. An unrecognized or rapidly expanding hematoma can cause airway compromise and asphyxiation. The incidence of hemorrhage after thyroid surgery is low (0.3-1%), but the surgeon must be aware of this potentially fatal complication. Patients with postoperative bleeding present with neck swelling, neck pain, and/or signs and symptoms of airway obstruction (eg, dyspnea, stridor, hypoxia). Immediately examine such patients for evidence of hematoma. Imaging studies are of no benefit in the initial stage of evaluation. Physical examination is the critical step in evaluation. Do not waste time with imaging studies when active bleeding is possible. All bandaging should be removed and the neck examined for possible swelling indicating a wound hematoma. Imaging studies such as CT scanning and ultrasonography may be useful in cases of mild neck swelling without airway compromise. The surgeon must carefully assess the airway before transferring a patient for radiologic studies. Fiberoptic laryngoscopy may be warranted in patients with airway issues without apparent wound hematoma to assess vocal fold function. Sound surgical technique is essential. The thyroid is a highly vascular organ and bleeds copiously. Therefore, care must be taken to avoid traumatizing the thyroid tissue during the procedure. The prevention of postoperative bleeding depends on good intraoperative hemostasis. Hemostasis in thyroid surgery is achieved by means of clamp and tie, surgical clips, diathermy, ultrasonic coagulating-dissection such as a harmonic scalpel (HS) or electrothermal bipolar vessel sealing systems (EBVSS). Before closing the wound, irrigate it well and address all residual bleeding. Finally, avoid the use of neck dressings. A dressing that covers the wound may mask hematoma formation, delaying its recognition. Controversy still surrounds the use of drains after thyroid surgery. The authors do not advocate the postoperative use of drains (active or passive). Results of several prospective studies have disputed the usefulness of drains. Debry et al (1999) prospectively evaluated the usefulness of drains after thyroidectomy in a randomized trial for 100 patients. Four patients, all of whom received drains, developed hematomas. No definitive evidence suggests that drains prevent hematoma or seroma formation. If a drain is placed, its use should not substitute for intraoperative hemostasis. Nonsuction drainage is not recommended because it increases the infection risk and the need for neck dressings. These dressings obstruct the view of the neck and may delay diagnosis of a hematoma. If a neck hematoma is compromising the patient's airway, open the surgical incision at the bedside to release the collection of blood, and immediately transfer the patient to the operating room. In the case of a hematoma without impending airway obstruction, transfer the patient to the operating room as soon as is practical. Remain with the patient and be prepared to assist with airway management. In the operating room, open the surgical incision, explore the wound, irrigate it, control all bleeding sites, and close the wound. The recurrent laryngeal nerve (RLN) innervates all of the intrinsic muscles of the larynx with the exception of the cricothyroid muscle, which is innervated by the superior laryngeal nerve (SLN). Mechanisms of injury to the RLN include complete or partial transection, traction, contusion, crush, burn, misplaced ligature, and compromised blood supply. The consequence of an RLN injury is true vocal-fold paresis or paralysis. Patients with unilateral vocal fold paralysis present with postoperative hoarseness or breathiness. The presentation is often subacute. At first, the vocal fold usually remains in the paramedian position, creating a fairly normal voice. Definite vocal changes may not manifest for days to weeks. The paralyzed vocal fold atrophies, causing the voice to worsen. Other potential sequelae of unilateral vocal-fold paralysis are dysphagia and aspiration. Bilateral vocal-fold paralysis may occur after total thyroidectomy, and it usually manifests immediately after extubation. Both vocal folds remain in the paramedian position, causing partial airway obstruction. Patients with bilateral vocal-fold paralysis may present with biphasic stridor, respiratory distress, or both. On occasion, the airway is sufficient in the immediate postoperative period despite the paralyzed vocal folds. At follow-up, such patients may present with dyspnea or stridor with exertion. Techniques for assessing vocal fold mobility include indirect and fiberoptic laryngoscopy. Documentation of vocal fold mobility should be a routine part of the preoperative physical examination of any patient presenting with a thyroid mass. Postoperative visualization should also be performed, as these patients may be asymptomatic, especially at first. Laryngeal electromyography (EMG) may be useful to distinguish vocal fold paralysis from injury to the cricoarytenoid joint secondary to intubation. Furthermore, EMG may yield information concerning the prognosis of the patient with RLN injury. Parnes et al (1985) performed laryngeal EMG in 24 patients with vocal fold paralysis due to numerous etiologies (eg, idiopathic causes, surgery, tumor, trauma, neurologic diseases). No patient in whom EMG revealed an absence of motor unit potentials or fibrillation potentials regained movement of the true vocal fold. Of 14 patients who had normal or polyphasic action potentials, 11 regained function. However, most of the tests were performed more than 6 months after the onset of paralysis; therefore, this study revealed little regarding the usefulness of early EMG testing. The patient with bilateral paralysis of the true vocal folds who presents with airway obstruction after extubation likely requires emergency reintubation or tracheotomy. Fiberoptic laryngoscopy may be performed to confirm the diagnosis if the patient is clinically stable. Deliberate identification of the RLN minimizes the risk of injury. When the nerve is identified and dissected, the reported RLN injury rate during thyroidectomy is 0-2.1%. 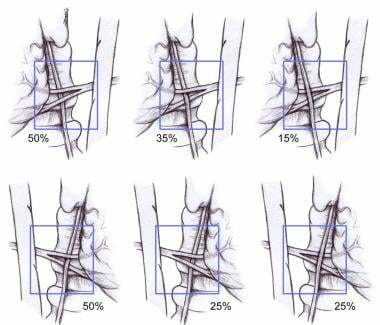 This rate is reportedly higher if surgery is repeated (2-12%) or if the nerve is not clearly identified (4-6.6%). Intraoperative hemostasis and a thorough understanding of the anatomy are essential for identifying and preserving the nerve. The course of the RLN differs on the right and left sides of the neck (see the image below). The left RLN branches from the vagus at the level of the aortic arch. It then passes below the arch and reverses its course to continue superiorly, posterior to the aortic arch and into the visceral compartment of the neck. It travels near or in the tracheoesophageal groove until it enters the larynx just behind the cricothyroid articulation. The right RLN branches from the vagus more superiorly than does the left, at the level of the subclavian artery. It loops behind the right subclavian artery and ascends superomedially toward the tracheoesophageal groove. It then continues superiorly until entering the larynx behind the cricothyroid articulation. Classic descriptions of the RLNs hold that they ascend in the tracheoesophageal groove; however, they may in fact be lateral to it. Low in the neck, the course of the right RLN is relatively oblique and lateral and, probably, more prone to injury than the left RLN. The nerve may branch several times before entering the larynx. Take care to identify and preserve each branch. In approximately 5 of 1000 patients, a nonrecurrent laryngeal nerve is found on the right side. This arrangement occurs when a retroesophageal right subclavian artery arises from the dorsal side of the aortic arch. The nonrecurrent laryngeal nerve branches from the vagus at approximately the level of the cricoid cartilage and directly enters the larynx without looping around the subclavian artery. A left-sided nonrecurrent laryngeal nerve RLN can occur only when a right-sided aortic arch and ligamentum arteriosum are concurrent with a left retroesophageal subclavian artery. The inferior thyroid artery has been described as an important landmark for identifying the RLN. However, its relationship to the nerve is subject to variation (see the image below). Numerous descriptions and attempts to quantify the percentages of each relationship of the nerve to the artery have been put forth. Percentages differ on the right and left sides. On the right, the nerve runs between branches of the artery in approximately 50% of patients. The nerve is anterior to the artery in 25% and posterior in 25%. On the left, the nerve courses posteriorly to the artery in 50% of patients; in approximately 35%, the nerve runs between branches. In only 15% is it anterior to the artery. In summary, the nerve is always near the artery, but the exact relationship cannot be determined with certainty. Therefore, the inferior thyroid artery is not a dependable landmark for identifying the nerve. Relationship of the recurrent laryngeal nerve (RLN) to the left and right inferior thyroid arteries. Several approaches are used to identify and preserve the RLN. The authors' preferred approach involves finding the nerve at its point of laryngeal entry, which is approximately 0.5 cm below the inferior cornu of the thyroid cartilage. Thyroid tissue in the region of the ligament of Berry is meticulously dissected from the trachea by carefully ligating traversing vessels. This technique exposes the RLN as it enters the larynx. It also minimizes the compromise of blood supply to the parathyroids and limits the extent of dissection involving the nerve. Thick connective tissue called the Berry ligament attaches the thyroid to the trachea at the level of the second or third tracheal ring. This is the most common site of injury to the RLN The nerve may run deep to the ligament, pass through it, or even penetrate the gland a short distance at this level. Be extremely careful in this area during surgery. Retraction of the thyroid lobe may result in traction injury and make the nerve susceptible to transection. The path of the nerve must be clearly identified. Continuous electrophysiologic monitoring of the RLN during thyroid surgery is easily performed. Two EMG devices include an endotracheal-tube electrode (Xomed-Treace, Jacksonville, FL) and an RLN-postcricoid-laryngeal surface electrode. Both provide useful EMG information and help to reveal the location of the RLN. Use of EMG is controversial and has not been recommended for routine thyroid surgery given the low rate of RLN injury. The authors know of no randomized studies that have been performed to compare the rate of postoperative RLN palsy in visual versus electrophysiologic RLN detection in thyroid surgery. (A literature review by Deniwar et al indicated that adjunctive use of intraoperative electrophysiologic neuromonitoring may be no more effective than visual nerve identification alone for avoiding RLN injury during thyroid surgery; no significant difference in the incidence of RLN injuries was found in a comparison of both monitoring methods.  ) The additional information EMG provides may be beneficial in patients undergoing revision thyroid surgery, in patients with previously radiated necks, in patients with large masses, or in patients with contralateral nerve palsy. In the setting of unilateral vocal-fold paralysis, management of the contralateral thyroid is controversial. In the authors' experience, given the low rate of RLN injury, the best approach is not changing appropriate oncologic management and proceeding with total thyroidectomy. Exceptions may include a young patient who presents with a low (< 6) multifactor activated immune cell (MAIC) score. For such a patient, nonoperative treatment may be considered, with appropriate care coordinated with an endocrinologist. Do not perform corrective procedures for unilateral vocal-fold paralysis until at least 6 months after thyroidectomy because a reversible injury improves by that time. If the nerve was definitely transected during surgery, treatment for the paralyzed fold may be performed sooner than this. Two surgical treatment options are available for patients with unilateral vocal-fold paralysis: medialization and reinnervation. Medialization is most commonly performed. However, the authors' knowledge, no investigator has compared the efficacy of these 2 procedures. Medialization of the impaired vocal fold improves contact with the contralateral mobile fold. It may be accomplished with injection laryngoplasty or laryngeal framework surgery. Type I thyroplasty is probably the most common procedure. A window in the thyroid cartilage is created at the level of the true vocal fold. An implant is then placed to push the vocal fold medially. Medialization with an injection of absorbable gelatin sponge (Gelfoam; Pharmacia & Upjohn Company, Kalamazoo, MI) may be performed before 6 months if the patient desires it or if he or she has is aspirating. The gelatin sponge resorbs over time and is, therefore, a temporary treatment. An implant made of silicone or polytetrafluoroethylene (PTFE, Gore-Tex; W. L. Gore & Associates, Inc; Newark, DE) is considered permanent. However, most authorities agree that no negative consequences occur if nerve recovers function after a type I thyroplasty. In addition, the implant may be removed, though this requires another surgical procedure. A number of reinnervation procedures have been described for addressing the permanently injured RLN. These procedures maintain or restore tone to the intrinsic laryngeal musculature. When the true vocal fold atrophies after denervation, it loses contact with the contralateral fold and the voice weakens. By preventing atrophy, reinnervation procedures may help maintain or improve the patient's voice. Primary neurorrhaphy may be used to immediately repair the transected RLN. This procedure typically results in synkinesis because of nonselective reinnervation of abductor and adductor muscles. Reinnervation procedures have been described by using the phrenic nerve, ansa cervicalis, and preganglionic sympathetic neurons. Although animal models demonstrated EMG and histologic evidence of reinnervation, as well as restored movement of the vocal fold, experience in humans has not been as impressive as this. Improvement in phonation quality has been documented in humans after reinnervation with the ansa cervicalis, but no movement is observed. Transfer of neuromuscular pedicles have been described and reportedly restore movement of the vocal fold. However, these reports are limited, and success is not universal. In bilateral vocal-cord paralysis, initial treatment involves obtaining an adequate airway. Emergency tracheotomy may be required. If possible, first perform endotracheal intubation. Consider exploring the neck to ensure that no reversible causes of nerve injury (eg, misplaced ligature) are present. When good preservation of the RLNs is ascertained, a trial of extubation may be performed after several days. Intravenous steroids may be beneficial in this situation. Remove the tube over a Cook catheter and in a controlled setting in case reintubation is necessary. Be ready to perform emergent tracheotomy. If nerve function has not recovered after a second trial of extubation, tracheotomy is certainly warranted. The principal goal for surgery in bilateral vocal-fold paralysis is to improve airway patency. Cordotomy and arytenoidectomy are the most common procedures. These procedures enlarge the airway and may permit decannulation of a tracheostomy. However, the patient must be counseled that his or her voice will likely worsen after surgery. Transfer of a neuromuscular pedicle is reported to improve the airway in cases of bilateral true vocal-fold paralysis. However, again, these reports are limited, and this treatment is not a widely accepted. The parathyroid glands produce parathyroid hormone (PTH), which is intimately involved in the regulation of serum calcium. PTH increases serum calcium levels by causing bone resorption, increasing renal absorption of calcium, and stimulating the synthesis of the biologically active form of vitamin D (1,25-dihydroxy vitamin D). 1,25-Dihydroxy vitamin D increases serum calcium levels by means of a number of mechanisms, including increasing the intestinal absorption of calcium. PTH also increases renal excretion of phosphorus. Therefore, low PTH levels result in high serum phosphorus levels. Inadequate production of PTH leads to hypocalcemia. Hypoparathyroidism, and the resulting hypocalcemia, may be permanent or transient. The rate of permanent hypoparathyroidism is 0.4-13.8%. The condition may be due to direct trauma to the parathyroid glands, devascularization of the glands, or removal of the glands during surgery. The rate of temporary hypocalcemia is reportedly 2-53%. The cause of transient hypocalcemia after surgery is not clearly understood. It may be attributable to temporary hypoparathyroidism caused by reversible ischemia to the parathyroid glands, hypothermia to the glands, or release of endothelin-1. Endothelin-1 is an acute-phase reactant known to suppress PTH production, and levels have been elevated in patients with transient hypoparathyroidism. Other hypotheses have been put forth to account for transient hypocalcemia not caused by hypoparathyroidism. These include calcitonin release and hungry-bone syndrome. Calcitonin is produced by the thyroid and inhibits bone breakdown while stimulating renal excretion of calcium. Its effects on calcium metabolism oppose those of PTH. Hungry-bone syndrome occurs in patients with preoperative hyperthyroidism. These patients have increased bone breakdown in their hyperthyroid state. When a patient's thyroid hormone level drops acutely after surgery, his or her stimulus to break down bone is removed. The bones, now "hungry" for calcium, remove calcium from the plasma, decreasing serum calcium levels. Risk factors for hypocalcemia after thyroidectomy include Graves disease and malignancy. The type of procedure performed (total thyroidectomy, thyroidectomy with neck dissection, repeat thyroidectomy, subtotal thyroidectomy, near-total thyroidectomy) also affects the risk in transient hypocalcemia after surgery. As more of the parathyroid gland inadvertently removed, the risk of hypocalcemia rises. Most patients who are hypocalcemic after thyroidectomy are initially asymptomatic. Symptoms and signs of hypocalcemia include circumoral paresthesias, mental status changes, tetany, carpopedal spasm, laryngospasm, seizures, QT prolongation on ECG, and cardiac arrest. Patients having undergone a procedure where all parathyroid glands have been placed at risk for injury (total thyroidectomy, subtotal thyroidectomy, or completion thyroidectomy) should undergo evaluation for iatrogenic hypoparathyroidism. An effective method of evaluation of parathyroid function is to follow ionized calcium (or total calcium and albumin) levels in the perioperative period. If iatrogenic hypoparathyroidism is a concern, close follow-up care is warranted until calcium levels demonstrate that parathyroid function is intact. Hypocalcemia may also be indicated by presence of the Chvostek sign or the Trousseau sign. The Chvostek sign is elicited by tapping the region of the facial nerve in the preauricular area resulting in facial contractions. The Trousseau sign is carpal spasm that may be elicited by inflation of a blood pressure cuff on the upper arm. In the setting of hypocalcemia, other causes (renal failure, hypomagnesemia, medications) may be considered. Serum phosphorous levels are elevated in patients with hypoparathyroidism secondary to decreased renal excretion; this difference may help in distinguishing low PTH levels due to other etiologies of hypocalcemia (eg, hungry bone syndrome). Regardless of the etiology, the management is unchanged. If uncertainty remains 6 months after surgery, PTH levels may be checked evaluate recovery of parathyroid gland function. The best way to preserve parathyroid gland function is to identify the glands and to maintain their blood supply. A large cadaveric study to identify the most common positions of the parathyroid glands demonstrated that 77% of superior parathyroid glands were at the cricothyroid junction and intimately associated with the RLN. About 22% of the superior parathyroid glands were on the posterior surface of the upper lobe of the thyroid. Approximately 1% of the superior glands were behind the junction of the hypopharynx and upper esophagus. The study demonstrated that the location of the inferior parathyroid glands was variable. Forty-two percent were on the anterior or lateral surfaces of the lower lobe of the thyroid, often hidden by vessels or creases in the thyroid. Thirty-nine percent were located within the superior tongue of the thymus. Fifteen percent were extrathyroidal and lateral to the lower lobe. Two percent were in the mediastinal thymus, and another 2% were in other ectopic positions, such as the carotid sheath. The ectopic inferior parathyroid glands were consistently associated with remnant thymus tissue. The inferior parathyroid glands and the thymus both develop from the third branchial pouch, a finding that explains the close association of these structures. The inferior parathyroid glands receive their blood supply from the inferior thyroid artery. The superior parathyroids also usually receive their blood supply from the inferior thyroid artery. However, in some cases, the superior parathyroids receive their vascular supply from the superior thyroid artery, the anastomotic loop between the inferior and superior thyroid arteries, or direct branches off the thyroid gland. The key to parathyroid preservation is identifying the parathyroids and preserving their blood supply by ligating all vessels distal to them. Ligate the vessels as close to the thyroid gland as possible. Recognition of the parathyroid glands, which appear in various shapes and which have a caramel-like color, is critical. When they lose their blood supply, they often darken in appearance. The surgical wound and the excised thyroid gland should be carefully examined for parathyroid tissue. The devascularized gland (pathologically confirmed with frozen-section analysis), should be removed, cut into 1- to 2-mm pieces, and reimplanted into a pocket created in the sternocleidomastoid muscle or strap muscle. The location may be marked with a permanent suture or a metallic hemoclip for easier identification in any future surgeries. Patients who have asymptomatic hypocalcemia in the early postoperative period should not be treated with supplemental calcium. The hypocalcemic state may stimulate the stunned parathyroid glands to produce PTH. Patients who have symptomatic hypocalcemia in the early postoperative period or whose calcium levels continue to fall rapidly require treatment. In symptomatic patients, replace calcium with intravenous calcium gluconate. Ten milliliters of 10% solution (1 g) may be administered over 10 minutes. A calcium infusion may be started at a rate of 1-2 mg/kg/h if symptoms do not resolve. Titrate the infusion to the patient's symptoms and calcium levels. Typically, patients that begin to have symptoms can be started on oral calcium. One to two grams of elemental oral calcium should be supplied each day. Calcium carbonate 1250 mg provides 500 mg of elemental calcium; therefore, the patient should take 2500-5000 mg/day. The patient needs concomitant replacement of vitamin D with calcitriol (Rocaltrol) 0.25-1 mcg/d. The calcium supplementation should be divided 4 - 5 times per day rather than in a single dose to maximize absorption by the GI tract. Endocrinology consultation may provide assistance in monitoring of calcium levels and the medical management of the sequelae of hypoparathyroidism. In 1-2 months, an attempt to wean the patient off oral calcium may be made to reveal if the hypoparathyroidism is temporary. Dependence on calcium supplementation for longer than 6 months usually indicates permanent hypoparathyroidism. Thyrotoxic storm is an unusual complication of thyroid surgery. This condition may result from manipulation of the thyroid gland during surgery in the patients with hyperthyroidism. It can develop preoperatively, intraoperatively, or postoperatively. Surgery is generally recommended only when patients have Graves disease and other treatment strategies fail or when underlying thyroid cancer is suspected. Thyrotoxic storm is potentially lethal and must be dealt with astutely. Signs of thyrotoxic storm in the anesthetized patient include evidence of increased sympathetic output, such as tachycardia and hyperthermia. Other symptoms and signs in the awake patient include nausea, tremor, and altered mental status. Cardiac arrhythmias may also occur. If treatment is not given, the patient may progress to coma. Preoperative awareness of the hyperthyroid patient and appropriate medical treatment are the keys preventing thyrotoxic storm. Patients undergoing thyroidectomy for persistent thyrotoxicosis require treatment based on the time available and the severity of symptoms. The goal is to restore a state as close to euthyroid as possible before surgery. Medical management is directed at targets of the thyroid hormone synthetic, secretory, and peripheral pathways. These include thioamides (methimazole, propylthiouracil [PTU]), which affect synthesis. PTU also inhibits peripheral deiodination (thyroxine [T4] to triiodothyronine [T3]). Iodine used at supraphysiologic doses decreases synthesis of new thyroid hormone (the Wolff-Chaikov effect), and it has an onset of action within 24 hours and a maximum effect at 10 days. Beta-blockers should be given to every thyrotoxic patient unless contraindicated (eg, congestive heart failure [CHF]). High doses of glucocorticosteroids impair peripheral conversion of T4 to T3 and are used for when thyrotoxicosis is severe and when rapid management is necessary. Morbidity and mortality rates in adequately prepared patient are low. The first step in managing a thyrotoxic crisis during thyroidectomy is to stop the procedure. Intravenous beta-blockers, PTU, sodium iodine, and steroids are administered to control sympathetic activity, the release of thyroid hormone, and hyperthermia. Use cooling blankets and cooled intravenous fluids to reduce the patient's body temperature. Carefully monitor oxygenation, because oxygen demands increase dramatically during a thyroid storm. Removal of the thyroid gland does not immediately relieve thyrotoxicosis because the half-life of circulating T4 is 7-8 days. As thyroid hormone levels decrease and as symptoms resolve, medications should be gradually weaned over the weeks after surgery. An endocrinologist should be consulted to assist in this process. The SLN has 2 divisions: internal and external. 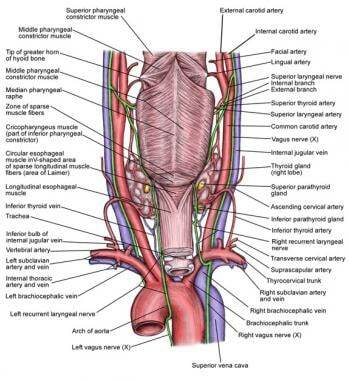 The internal branch provides sensory innervation to the larynx. It enters the larynx through the thyrohyoid membrane and, therefore, should not be at risk during thyroidectomy. 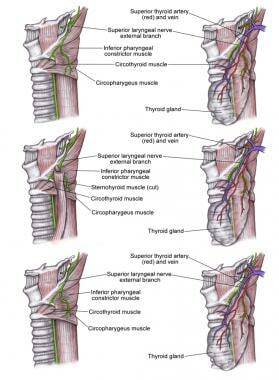 The external branch provides motor function to the cricothyroid muscle and is at risk during thyroidectomy. This muscle is involved in elongation of the vocal folds. Trauma to the nerve results in an inability to lengthen a vocal fold and, thus, an inability to create a high-pitched sound. The external branch of the SLN is probably the nerve most commonly injured in thyroid surgery. The rate of injury to the external branch of the SLN is estimated at 0-25%. This rate is probably underestimated, because the diagnosis is frequently missed. The clinical presentation of a patient with SLN paralysis may be subtle. Most patients do not notice any change. On occasion, a patient presents with mild hoarseness or decreased vocal stamina. However, for the singer or person who professionally relies on his or her voice, paralysis of the SLN may threaten his or her career. The most damaging consequence is loss of the upper register. Diagnosing an SLN injury with indirect or fiberoptic laryngoscopy is difficult. Posterior glottic rotation toward the paretic side and bowing of the vocal fold on the weak side may be noted. In addition, the affected vocal fold may be lower than the normal vocal fold. Use of videostroboscopy and laryngeal EMG has enhanced the ability of otolaryngologists and speech pathologists to diagnose SLN paralysis. Videostroboscopy demonstrates an asymmetric, mucosal traveling wave. EMG demonstrates cricothyroid muscle denervation. The external SLN branch travels inferiorly along the lateral surface of the inferior constrictor until it terminates at the cricothyroid muscle. This branch is intimately related to the superior thyroid artery, though its exact relation to the artery varies. Data from a recent cadaveric study suggested that the nerve may cross the superior thyroid artery more than 1 cm above the upper pole of the thyroid gland (42%), less than 1 cm above the upper pole (30%), or under the upper pole (14%). In some people, the nerve runs dorsal to the artery and crosses only its terminal branches after the artery has ramified (14%). A critical area 1.5-2 cm from the thyroid capsule is described. In this area, the external branch of the SLN is most intimately involved with the branches of the superior thyroid artery. Most surgeons agree that identifying the SLN, in contrast to the RLN, is unnecessary. Instead, ligate the terminal branches of the superior thyroid artery as close to the thyroid capsule as possible to avoid damaging the nerve. Electrophysiologic monitoring of the SLN is described, but it is not recommended for routine use. Direct trauma to the cricothyroid muscle can cause fibrosis and poor muscle function, which may result in a presentation similar to that of a patient with an injury to the external branch of the SLN, even when the nerve is preserved. Therefore, dissect carefully near this muscle and avoid electrocautery damage when possible. At present, the only treatment available for injury to the external branch of the SLN is speech therapy. Infection was the major cause of death from thyroid surgery during the 1800s. Today, infection occurs in less than 1-2% of all cases. Death is unlikely if the infection is recognized and treated promptly and appropriately. Postthyroidectomy infection may manifest as superficial cellulitis or as an abscess. Patients with cellulitis typically present with erythema, warmth, and tenderness of neck skin around the incision. A superficial abscess may be diagnosed on the basis of fluctuance and tenderness. A deep neck abscess may manifest subtly, but signs such as fever, pain, leukocytosis, and tachycardia should raise clinical suspicion. Send purulence expressed from the wound or drained from an abscess for Gram staining and culturing to direct the choice of antibiotics. CT imaging is useful when a deep neck abscess is thought possible. In addition, a deep neck abscess should raise concern about possible esophageal perforation. An esophageal swallow study performed with sodium amidotrizoate and meglumine amidotrizoate solution (Gastrografin) may be useful in certain cases. The key to preventing postoperative infection is the use of sterile surgical technique. Routine use of perioperative antibiotics in thyroid surgery has not been proven beneficial. Johnson and Wagner (1987) retrospectively reviewed 438 patients who underwent uncontaminated head and neck surgery at the Eye and Ear Hospital of Pittsburgh. Of 113 patients who received thyroidectomy, only 12 were given antibiotics perioperatively. None of the thyroidectomy-treated patients had a postoperative wound infection. This result suggests that perioperative antibiotics are not useful. Antibiotics should not be used unnecessarily in the current era of multidrug-resistant bacteria. Perioperative antibiotics are not recommended for thyroid surgery. Treat cellulitis with antibiotics that provide good coverage against gram-positive organisms (eg, against staphylococci and streptococci). Drain abscesses, and direct antibiotic coverage according to culture findings. If patients have deep neck abscesses, begin with broad-spectrum antibiotics (eg, cefuroxime, clindamycin, ampicillin-sulbactam) until definitive culture results are available. Untreated hypothyroidism causes symptoms such as cold intolerance, fatigue, constipation, muscle cramping, and weight gain. Hypothyroidism secondary to thyroid surgery should never be left untreated long enough to elicit signs and symptoms of myxedema (eg, hair loss, large tongue, cardiomegaly). Expect, diagnose, and promptly treat postoperative hypothyroidism. The most useful laboratory test for detecting or monitoring of hypothyroidism in the patient who has undergone thyroidectomy is the measurement of thyrotropin (thyroid-stimulating hormone [TSH]) levels. Total T4 and T3 levels may be useful to fine-tune the dosing of levothyroxine (Synthroid), but may be unhelpful in the typical postoperative patient. Hypothyroidism is an expected sequela of total thyroidectomy. In goiter surgery, the extent of thyroidectomy is controversial. The main goal of surgery is to prevent recurrent hyperthyroidism because recurrent hyperthyroidism after surgery is more difficult than permanent hypothyroidism to manage. Because of this fact, the present authors recommend total thyroidectomy in this setting. For hypothyroid patients, start levothyroxine (about 1.7 mcg/kg/d). Check their thyrotropin level in approximately 4-6 weeks, and adjust the dosage appropriately. Patients who are to receive postoperative radioiodine scanning must stop taking levothyroxine before the procedure. Consider assistance from an endocrinologist during this period to ensure appropriate monitoring (eg, of renal insufficiency due to hypothyroidism). The traditional approach to thyroidectomy involved a long, low cervical incision. This has evolved to a shorter incision placed in a skin crease higher in the neck. However, a resultant neck scar remains. Multiple approaches have been developed to eliminate the neck scar. New technologies have allowed for various approaches. The development of videolaparoscopic surgery in the last decade has allowed several operations to be performed with minimally invasive techniques. After the first parathyroidectomy procedure was performed endoscopically in 1996, this minimally invasive approach was applied to thyroid surgery. Minimally invasive video-assisted thyroidectomy (MIVAT) was described in 1998. The technique was described using a central access with a 1.5-cm incision and external retraction. Video-assisted thyroidectomy was tested successfully in animals and has been performed safely in human patients. Postoperative morbidity rates in patients seem to be equivalent to those of patients who have undergone conventional surgery. Chao et al (2004) prospectively compared video-assisted thyroid lobectomy and conventional lobectomy in 116 patients with thyroid nodules. No deaths, hematomas, wound infections, cases of hypothyroidism, or RLN palsies were reported. Damage to the SLN occurred in 6 (10.2%) patients after conventional surgery and in no patients in the video-assisted group. Transient RLN palsy occurred in 5 (8.5%) patients who underwent conventional surgery versus 3 (5.8%) patients in the video-assisted group; the difference was not significant. Patients in both groups were discharged home on the second postoperative day. In a 5-year study, Miccoli et al (2004) selected 579 patients to undergo MIVAT. The operation consisted of total thyroidectomy in 312 patients and lobectomy in 267. The mean operative time was 41 minutes (range, 15-120 min) for lobectomy and 51.6 minutes (range, 30-140 min) for total thyroidectomy. The postoperative hospital stay was 24 hours (overnight discharge) for all patients. Complications included postoperative bleeding (0.1%), recurrent nerve palsy (1.3%), and definitive hypoparathyroidism (0.2%). Some have suggested that pain following VAT is less when compared with conventional thyroidectomy because of limited dissection, retraction, and injury to tissues. MIVAT provides endoscopic magnification of nerves and vessels, potentially decreasing the risk of injury to these structures. This approach may also help improve aesthetic results. However, the cosmetic result obtained with an appropriately sized and placed conventional incision is also good. The endoscopic technique cannot be used in nodules larger than 35 mm or in goiters because the specimen is too large to retrieve through the incision. In addition, this technique is not ideal for removing carcinomas in which an intact capsule is desired for oncologic reasons and for accurate histologic assessment. In summary, if the general principals of conventional thyroid surgery are followed, video assistance may help in identifying structures and in minimizing the incision. Experienced surgeons may consider using this technique when the equipment and additional surgical staff is available for patients with small follicular nodules/adenomas, or well-differentiated papillary carcinoma, or when prophylactic thyroidectomy is being performed in patients with ret protooncogene mutations. Transaxillary thyroidectomy was initially performed with the assistance of endoscopic technology. Robotic technology was then introduced to this approach in 2007. This provided a 3-dimensional field of view with magnification, stabilized visual field, and the potential to use 3 arms under the control of a single surgeon. The robotic technology also provides tremor filtration and fine motion scaling to allow precise manipulation of tissues. Kang et al described a series of 338 patients that underwent a robot-assisted transaxillary thyroidectomy. This report indicated a significant learning curve with approximately 45 robotic procedures before length of surgery stabilized with surgeons that had previously used a transaxillary endoscopic approach. The complication rate was similar to historical open thyroidectomy approach. This approach has introduced new complications not associated with thyroidectomy in the past. Due to the transaxillary approach and the patient armpositioning,brachialplexusinjuries have been reported. Additionally, this procedure typically has a longer operative time and increased blood loss. This approach has also been used for the treatment of well-differentiated thyroid carcinoma. Transient hypocalcemia has been found to be more frequent in the robotic approach. The transaxillary robot assisted thyroidectomy approach appears to be replacing endoscopic approaches. The overall experience of alternate approaches to thyroidectomy is in the early stages. Whether any of these approaches will replace the traditional open neck approach to thyroidectomy for benign or malignant disease remains to be seen. Overall complications are similar although the transaxillary approach introduces brachial plexus injuries as potential problems. Electrothermal bipolar vessel sealing system (EBVSS) delivers precise amount of energy, resulting in limited thermal spread to adjacent tissues, including critical structures such as the parathyroid glands and recurrent laryngeal nerve. Some studies suggest that the use of EBVSS results in shorter operating time, decreased postoperative drain volume, decreased transient postoperative hypoparathyroidism and hypocalcemia, and decreased postoperative stay compared with suture ligature technique. What improvements have led to a decreased mortality rate for thyroid surgery? What is the prevalence of complications of thyroid surgery? What are minor complications that may result from thyroid surgery? What are rare complications of thyroid surgery? What is the regional anatomy relevant to thyroid surgery? What was the mortality rate of thyroid surgery during the 1800s? What are potential major complications from thyroid surgery? What are minor complications from thyroid surgery? What are the signs and symptoms of hematoma following thyroid surgery and how is it managed? How are thyroid surgery complications prevented? How is recurrent laryngeal nerve (RLN) injury prevented during thyroid surgery? How is recurrent laryngeal nerve (RLN) injury due to thyroid surgery evaluated? What are the physical signs of recurrent laryngeal nerve (RLN) injury due to thyroid surgery? How is recurrent laryngeal nerve (RLN) injury due to thyroid surgery managed? How does hypoparathyroidism, result from thyroid surgery, and how is it evaluated? How is hypoparathyroidism, due to thyroid surgery treated? What are the signs and symptoms of thyrotoxic storm due to thyroid surgery? How is thyrotoxic storm treated during to thyroid surgery? How is injury to the superior laryngeal nerve due to thyroid surgery diagnosed and managed? How is postoperative infection prevented in patient undergoing thyroid surgery? What are the signs and symptoms of postoperative infection following thyroid surgery? How is postoperative infection diagnosed following thyroid surgery? How is postoperative infection following thyroid surgery treated? What hypothyroidism, monitored following thyroid surgery? What are the risks of intraoperative and postoperative bleeding of thyroid surgery? What are the signs and symptoms of postoperative bleeding, following thyroid surgery? What is included in the evaluation of patients with postoperative bleeding following thyroid surgery? How is postoperative thyroid surgery bleeding prevented? How is hematoma treated following thyroid surgery? What is the recurrent laryngeal nerve (RLN), and how is it injured during thyroid surgery? What are the signs and symptoms of recurrent laryngeal nerve (RLN) injury due to thyroid surgery? How is recurrent laryngeal nerve (RLN), injury following thyroid surgery diagnosed? How are injuries to the recurrent laryngeal nerve (RLN) during thyroid surgery prevented? What are relevant anatomic landmarks in thyroid surgery? How is the recurrent laryngeal nerve identified and preserved in thyroid surgery? What is the role of EMG in the prevention of recurrent laryngeal nerve injury during thyroid surgery? How are injuries to the recurrent laryngeal nerve in thyroid surgery managed? What is the role of primary neurorrhaphy in the management of recurrent laryngeal nerve injury due to thyroid surgery? What is the risk for permanent hypoparathyroidism due to thyroid surgery? What is the pathophysiology of hypercalcemia due to thyroid surgery? Which factors increase the risk of hypocalcemia after thyroidectomy? Which factors increase the risk of hypoparathyroidism after thyroid surgery? What are the signs and symptoms of hypocalcemia following thyroid surgery? What is included in the evaluation for hypoparathyroidism following thyroid surgery? How is hypoparathyroidism prevented following thyroid surgery? How is hypoparathyroidism managed following thyroid surgery? What causes thyrotoxic storm during thyroid surgery? What are the signs and symptoms of thyrotoxic storm during thyroid surgery? How is thyrotoxic storm during thyroid surgery prevented? What is the management for thyrotoxic storm during thyroid surgery? What is the postoperative management for thyrotoxic storm following thyroid surgery? What is the anatomy of the superior laryngeal nerve relevant to thyroid surgery? What are the signs and symptoms of superior laryngeal nerve (SLN) due to thyroid surgery? How are injuries to the superior laryngeal nerve (SLN) due to thyroid surgery diagnosed? How are superior laryngeal nerve (SLN) injuries due to thyroid surgery prevented? How are injuries to the superior laryngeal nerve (SLN) due to thyroid surgery treated? What is the mortality rate for thyroid surgery infection? What are the signs and symptoms of thyroid surgery infection? How is a thyroid surgery infection evaluated? How are thyroid surgery infections prevented? How is thyroid surgery infection treated? What are the signs and symptoms of hypothyroidism due to thyroid surgery? How is hypothyroidism due to thyroid surgery diagnosed? How is hypothyroidism prevented following thyroid surgery? How is hypothyroidism following thyroid surgery treated? How are neck scars eliminated in thyroid surgery? What is the efficacy of minimally invasive video-assisted thyroidectomy (MIVAT) in reducing complications? What are the benefits of using minimally invasive video-assisted thyroidectomy (MIVAT)? What is the efficacy of robot-assisted thyroidectomy in reducing complications of thyroid surgery? What is the efficacy of electrothermal bipolar vessel sealing system (EBVSS) in reducing complications of thyroid surgery? What is the efficacy of ultrasonic dissectors in reducing complications of thyroid surgery? How do the outcomes of inpatient and outpatient thyroid surgery compare? What are the guidelines issued by the American Academy of Otolaryngology—Head and Neck Surgery Foundation (AAO-HNSF) for avoiding complications of thyroid surgery? Pironi D, Pontone S, Vendettuoli M, et al. Prevention of complications during reoperative thyroid surgery. Clin Ter. 2014. 165 (4):e285-90. [Medline]. Meltzer C, Klau M, Gurushanthaiah D, et al. Risk of Complications after Thyroidectomy and Parathyroidectomy: A Case Series with Planned Chart Review. Otolaryngol Head Neck Surg. 2016 May 3. [Medline]. Caulley L, Johnson-Obaseki S, Luo L, Javidnia H. Risk factors for postoperative complications in total thyroidectomy: a retrospective, risk-adjusted analysis from the National Surgical Quality Improvement Program. Medicine (Baltimore). 2017 Feb. 96 (5):e5752. [Medline]. Al-Qurayshi Z, Randolph GW, Srivastav S, Aslam R, Friedlander P, Kandil E. Outcomes in thyroid surgery are affected by racial, economic, and heathcare system demographics. Laryngoscope. 2016 May 3. [Medline]. Ayala MA, Yencha MW. Outpatient Thyroid Surgery in a Low-Surgical Volume Hospital. World J Surg. 2015 May 29. [Medline]. Schoretsanitis G, Melissas J, Sanidas E. Does draining the neck affect morbidity following thyroid surgery?. Am Surg. 1998 Aug. 64(8):778-80. [Medline]. Debry C, Renou G, Fingerhut A. Drainage after thyroid surgery: a prospective randomized study. J Laryngol Otol. 1999 Jan. 113(1):49-51. [Medline]. Parnes SM, Satya-Murti S. Predictive value of laryngeal electromyography in patients with vocal cord paralysis of neurogenic origin. Laryngoscope. 1985 Nov. 95(11):1323-6. [Medline]. Deniwar A, Bhatia P, Kandil E. Electrophysiological neuromonitoring of the laryngeal nerves in thyroid and parathyroid surgery: A review. World J Exp Med. 2015 May 20. 5 (2):120-3. [Medline]. McMullen C, Rocke D, Freeman J. Complications of Bilateral Neck Dissection in Thyroid Cancer From a Single High-Volume Center. JAMA Otolaryngol Head Neck Surg. 2017 Jan 12. [Medline]. Wang YH, Bhandari A, Yang F, et al. Risk factors for hypocalcemia and hypoparathyroidism following thyroidectomy: a retrospective Chinese population study. Cancer Manag Res. 2017. 9:627-35. [Medline]. [Full Text]. Chen KC, Iqbal U, Nguyen PA, et al. The impact of different surgical procedures on hypoparathyroidism after thyroidectomy: A population-based study. Medicine (Baltimore). 2017 Oct. 96 (43):e8245. [Medline]. [Full Text]. Wong C, Price S, Scott-Coombes D. Hypocalcaemia and parathyroid hormone assay following total thyroidectomy: predicting the future. World J Surg. 2006 May. 30(5):825-32. [Medline]. Chao TC, Lin JD, Chen MF. Video-assisted open thyroid lobectomy through a small incision. Surg Laparosc Endosc Percutan Tech. 2004 Feb. 14(1):15-9. [Medline]. Lombardi CP, Raffaelli M, D'alatri L, De Crea C, Marchese MR, Maccora D. Video-assisted thyroidectomy significantly reduces the risk of early postthyroidectomy voice and swallowing symptoms. World J Surg. 2008 May. 32(5):693-700. [Medline]. Kang SW, Lee SC, Lee SH, et al. Robotic thyroid surgery using a gasless, transaxillary approach and the da Vinci S system: the operative outcomes of 338 consecutive patients. Surgery. 2009 Dec. 146(6):1048-55. [Medline]. Khavanin N, Mlodinow A, Kim JY, et al. Assessing Safety and Outcomes in Outpatient versus Inpatient Thyroidectomy using the NSQIP: A Propensity Score Matched Analysis of 16,370 Patients. Ann Surg Oncol. 2014 May 20. [Medline]. Tucker ME. Outpatient Endocrine Surgery Doesn't Raise Readmission Risk. Medscape Medical News. 2014 Apr 30. [Full Text]. [Guideline] Pullen LC. Thyroid Surgery: Guidelines for Improving Voice Outcomes. Medscape Medical News. 2013 Jun 4. [Full Text]. [Guideline] Chandrasekhar SS, Randolph GW, Seidman MD, et al. Clinical practice guideline: improving voice outcomes after thyroid surgery. Otolaryngol Head Neck Surg. 2013 Jun. 148 (6 Suppl):S1-37. [Medline]. [Full Text].